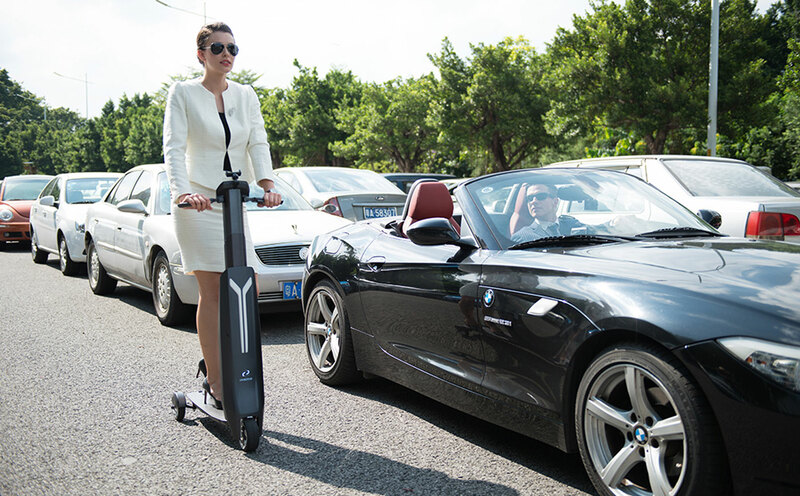 The Immotor Go is a battery-powered scooter that'll go for 20 miles on a single charge. Daniel Huang, co-founder of Mophie*, wants to change the way that we think about transport. That's why he quit the company that made him famous to start Immotor in April of 2016. Now, Huang is on a mission to "define the future of personal transportation." The result is the Immotor Go, a battery-powered foldaway scooter that's designed to travel for up to 30km on a single charge. We've seen plenty of other pedestrian-level electric transports, from ZBoard's electric skateboard through to whatever the hell we're calling Hoverboards these days. But Immotor is hoping that its battery tech savvy and almost Tesla-like approach to building a vehicle will give it an edge. For instance, the company says that the Go will receive periodic software updates that'll bring future upgrades to the vehicle whenever you buy one. In addition, the unit packs intelligent GPS, device tracking, cruise control and the ability to autonomously follow you around. Rounding out the spec list is Immotor's "safe and functional Super Battery," which it promises won't combust like so many other devices over the last few years. The company claims that its proprietary power cells come with a customized operating system that'll keep the cells balanced and regulate efficient power draw. In addition, these batteries can be puled out and used as a standard power pack for any number of consumer devices like hairdryers and laptops. At least, so long as you've got the necessary adapters. The company also offered up a credibility-straining claim that its Super Batteries won't explode, even when they've been punctured. When I pushed them for more explanation, the response could be boiled down to two points: firstly, the units are built with a thick metal casing that'll make it difficult for anyone to damage one by accident, and second because they just won't, okay, so stop being such a narc. Then again, Huang was CEO of Mophie for a decade and has been joined in his new firm by Christian Sheder, a former executive at XPal Power. So they're going to get an inch-worth of trust to demonstrate how these claims will operate out in the real world. The Go itself has two slots inside its neck-based battery compartment that enables users to swap in one or two of the 99W cells. With one installed, the device has an ultimate range of around 15km, while two cells will effectively double that journey time. The scooter has two modes: one that prioritizes range over speed and a power assist setting that'll boost the power when you're carrying heavy loads. Oh, and so long as it's folded, Immotor claims that it's perfectly safe to take onto an airplane. The vehicle's top speed is 30km, although that will inevitably have an effect on your overall range. There's also a series of features just for millennials, including the ability to charge your phone from a USB port in the handlebar. You can even use a button on one of the handles to activate the camera on your smartphone should you want to snap images as you ride. Each Go also comes with an always-on link to the company's customer service team, which should help with tracking if your ride goes missing and any technical issues. It all sounds like the sort of thing a hip urban commuter would love to zoom around with, but you can't buy one just yet. Instead, you'll have to pledge some cash to Indiegogo and wait until March or April 2017 for your device to ship. Early birds can grab one of these for the tasty price of $399, while latecomers will have to stump up $599. For that, you'll receive an Immotor Go with one 99W Super Battery and an AC adapter. * Or, more accurately, the company that went on to buy Mophie, adopt its name and turn it into a battery case sensation.